A tidy tester for your New 3DS’ excellent head-tracking 3D, but there’s too little for old hands to grasp onto. Even if you’re a first timer flyer it’s hardly a direct hit. Much like the story of a certain winged Grecian chap who took a day trip rather too close to the sun, this re-hash of 2011’s handheld take on the long-running airborne dog-fighting arcader looks tip-top from a distance, but get too close and it’s all a bit bum. It starts promisingly, from when you first set eyes on the initially impressive maps, through to nodding sagely at a satisfactorily-timed missile dodge. But Ace Combat proceeds to spiral away into mediocrity, rather than ascend up to the Legacy implied in its unwieldy title. You are Phoneix, a voiceless, faceless pilot roped into a conflict between loosely personified forces of rebels (bad) and allies (good). I would put a bit more effort into setting the scene than that, but, really, despite reams of banal between-mission dialogue and preparation files intended to give you the low-down on what to expect each time you head skyward, I get the distinct impression that I've already put in more effort than the game does. Which doesn't seem fair. From the outset there’s inherent promise in the story in that you’re not always just tasked with shooting down other planes. In one mission early on, for example, you’re asked to blow rebel supplies out of the sky. These potentially interesting directives are never suitably fleshed out to provide a palpable driving force to your actions, though. One element with equally flailing promise is the co-piloting system. A few missions in you’re given a choice of number two, a fellow AI flyer with whom to tear up the skies. Bland and without compelling arcs of their own to speak of, these choices quickly feel superfluous. Thankfully the act of flying feels a little deeper for a little longer. Controlling your craft has been streamlined to fit into your palms, with more advanced manoeuvres and functions cordoned off behind prompted button presses, rather than active deliberate inputs. A small gauge, for example, sits to the bottom right of your screen whenever you’re in range of a dog-fighting enemy plane. Let this fill optimally before giving the Y button a tap and you’ll automatically whip around behind your foe for a ruddy good missile barraging. Likewise when you’re being hounded by an enemy you can flick your Circle Pad and tap Y when the on-screen indicator flashes in order to (*resist all caps*) do a barrel roll and get out of the way. The New 3DS’ NFC capabilities are put to use, as you’re able to scan in your collection of amiibo to unlock specific plane loadouts with unique Nintendo-flavoured skins. Pop the plumber down and you’ll bag an F-22, a typically great all-rounder. Luigi, Peach, Bowser, Donkey Kong, Fox, Link, Samus, Captain Falcon, and Pac-Man amiibo are also supported. As such there’s a unique rhythm to the brand of air combat on offer here. Fights quickly become exercises in smooth timing, rather than slow positioning or tactical awareness. And it’s hard not to figuratively (or actually) fist pump with primal glee as the game celebrates your successes with pinging congratulations and swishing camera cuts to exploding bad guys. Eventually you’ll crest over these good times, however, and end up wondering when the depth will kick in. There’s a selection of differing modifications to peruse during the prep for each stage, with a smidgey bit of tinkering required depending on whether you’re facing ground or air-based targets. The problem is that regardless of what you choose to kick the tyres with, you end up lighting all the same fires when it comes to getting your black box dirty. Speaking of dirty, this is very much a re-working of a four year old game. The environments you rocket through can look distinctly ropey whenever you deign to get in close. Buildings are blocks of murk and it’s genuinely hard not to gawp incredulously at the mountainsides as you pass by. They’re so poorly textured that they would still look crap in one of those parental guide books which contain photos detailing the different consistencies of baby sick. So what’s new in this version, then? Well, sadly, the mathematical symbol at the top of this review refers to just two tangible things. First, the head-tracking 3D, made possible thanks to the New 3DS hardware. What was once a mere potential offering has become essential quality fuel. When you don’t have to worry about holding your machine in a head clamp to ensure stable 3D, swishing about without it is a non-option. The less essential addition is the inclusion of the new C-stick to tweak the camera. Unless you’re really keen to see your amiibo-unlocked jet skins from every angle more than once, then there’s very little to get excited about there. Indeed, it was only through giving it a random poke to see what it did that I even came across the fact that it’s used at all. If you’ve already bought and played through this game’s first iteration then there’s excruciatingly little to get your engines burning this time out. It plays the same: adequately. Its story peters out in the same fashion, and its visuals are delivered with the consistency of a panoramic photograph of the Himalayas viewed occasionally through the window of a vomit strewn bus shelter. A more than decent test of your new device’s excellent technology, sure, but (ahem - obvious Top Gun reference: engage) sadly there’s nothing here to take your breath away. 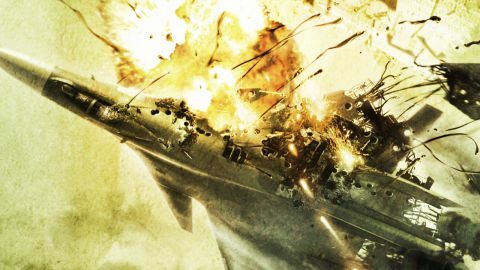 Description 2011's Ace Combat game gets an even longer title and natty 3D head-tracking in this New 3DS update.